The Physics of Nanoscience deals with the description of properties at nanolevel and self-organizing quantum processes of nanosystems. The state of the art is presented, and also future developments are theoretically discussed. The book starts with simple nanosystems and shows that the properties of nanosystems are very sensitive to small variations in the interaction potential, much more than in the bulk case. The structure and dynamics of nanosystems as a function of temperature is also discussed. Then self-organizing quantum processes - which are essential in the design of new nanosystems - are analyzed in detail and new aspects related to the quantum-theoretical nature of time are discussed leading to an expansion of the basic laws through nanotechnology. The book ends with a discussion of the effect of nanotechnological manipulations of brain functions and the need for the development of reliable models for the matter-mind complex. 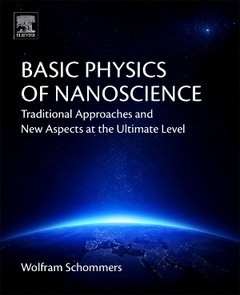 Wolfram Schommers is Professor of Theoretical Physics, Professor of Physics and Materials Sciences, and also Distinguished Professor of Physics in Europe, China and USA. He studied Theoretical Physics at the Technical Universities of Munich, and Münster, where he received the Diploma in Physics. After a brief intermezzo in the industry, he joined the Research Center of Karlsruhe and received his PhD in Theoretical Physics from the University of Karlsruhe. Professor Schommers’ scientific activities are concentrated on Computational and Theoretical Physics. His main research interests are nanophysics (nanoclusters, nanostructures and nanomachines, temperature effects, electronic states) and foundations of physics. He has published his researches and thoughts in 214 articles and book chapters. He authored/edited the following books: Nanodesign (World Scientific, 2014), Quantum Processes (World Scientific, 2011), Handbook of Theoretical and Computational Nanotechnology (10 volume set), (ASPBS, 2006). He is Principle Editor of the Book Series Foundations of Natural Science and Technology (World Scientific), Editor-in-Chief of the Journal of Computational and Theoretical Nanoscience, and Quantum Matter, European Editor of Advanced Science Letters (American Science Publishers). From 2005 to 2011 he was Editor-in-Chief of International Journal of Modern Physics B (World Scientific), and Modern Physics Letters B (World Scientific). He is Invited Member of the Humboldt Academy, Academic Board of the Humboldt Society, and Advisory Board of Medical Ethics of the 21th Century.